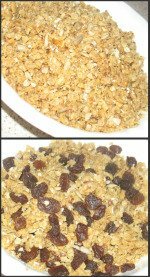 Homemade Granola Recipe that Our Family Loves! We absolutely love this homemade granola recipe. All the ingredients come from your food storage. Put these ingredients in a pan and heat them until they’re warm When heated they'll be a runny liquid. Pour the liquid over the dry ingredients and mix well. If you want your granola to be a little bit crunchy you can bake it. Divide the mixture between two cookies sheets or two 9” x 11” baking dishes. Bake the granola for 2 hours at 200°. Stir the mixture every 20 minutes. You don’t need to bake it. We like the granola soft and skip the whole baking process. Let it cool. 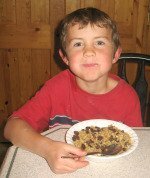 If you want you can add dried fruit (raisins, dried bananas, etc.). This healthy granola tastes great with yogurt, milk, fruit, or just plain.